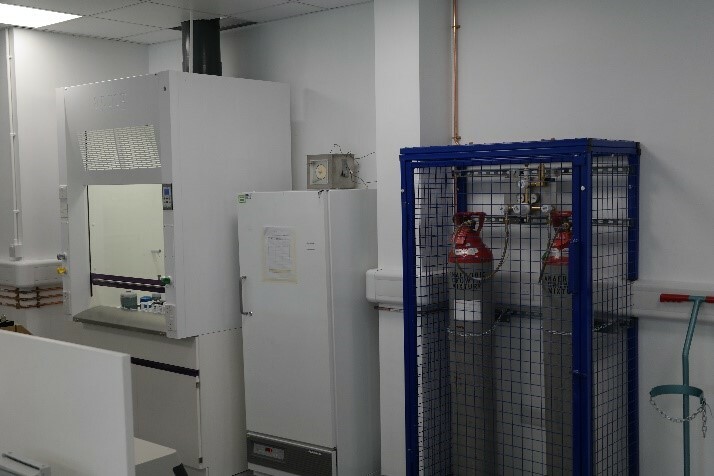 Laboratory Installation: From empty shell to fully-functioning bio laboratory including specialist gases, plumbing and electricity. Services supplied: Laboratory layout; design and configuration; installation and commissioning of specialist gases distribution system including storage facilities and change over units for CO2 and Anaerobic Gas; distribution of natural gas throughout the labs, along with plumbing and chemical waste system; Lab electrics including alarms and fume cupboards. 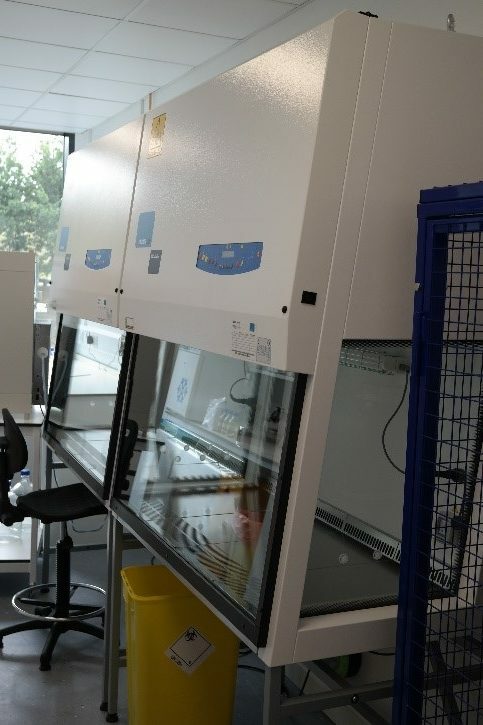 Following a period of rapid growth Perfectos Biomed decided to relocate their laboratory to improve efficiencies in the working environment with the scope grow in the future. 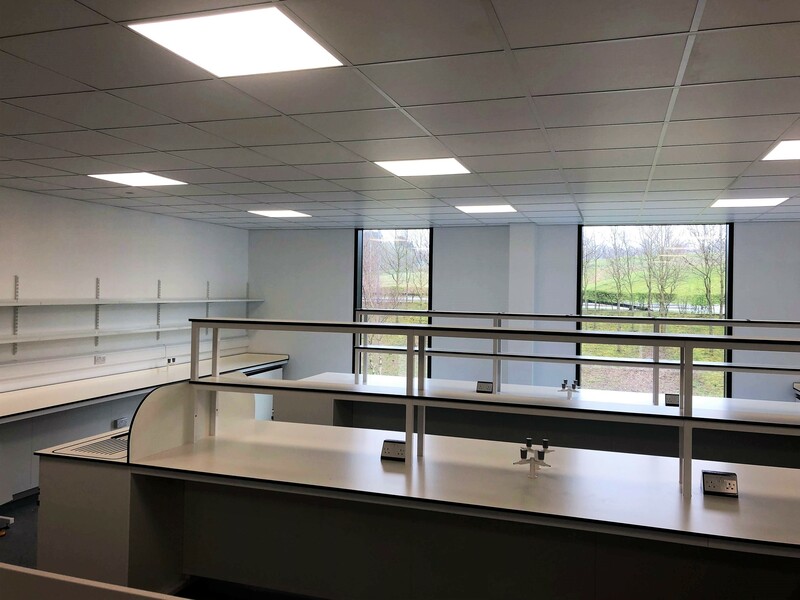 The newly built premises, at Techspace One in Daresbury, offered a blank canvas to design and install a purpose-built laboratory bespoke to their needs within a ten-week project timescale. 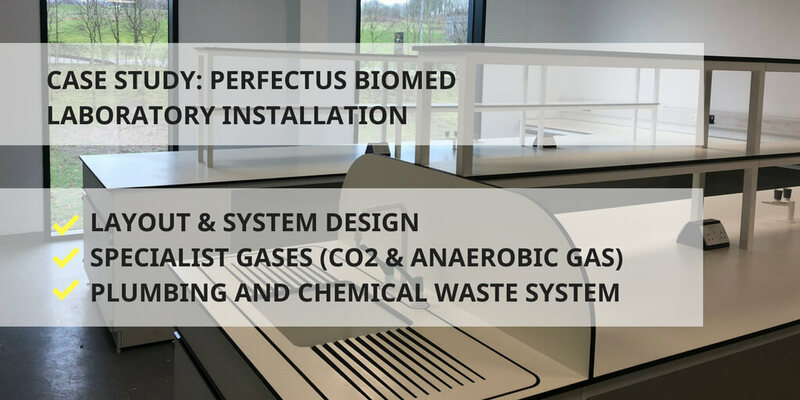 An empty shell gave Perfectus Biomed the opportunity to create a bespoke laboratory and the responsibility for full end-to-end design, installation and fit out of all kit, services and infrastructure such specialist lab gases, plumbing, waste and electricity. With a list of requirements for equipment and clear vision of their end goal, Higgins was appointed to provide the key infrastructure services - plumbing, waste, electrical, natural gas and specialist gas systems. •	Maximising the use of space: recommendations on positioning large equipment such as fume cupboards and incubators along with gas bottle storage whilst considering the pressure regulations and H&S to ensure the workspace is radical and utilised where space is a premium commodity with rental cost based on square foot. •	Sourcing suppliers and contractors: Including partitions, false ceilings, specialist laboratory furniture. •	Project Management: Liaising and communicating with multiple suppliers, managing timelines and ascertaining responsibility. Regularly keeping the client up-to-date with progress. •	Adherence to all required regulations and standards: Meeting all industry regulations including CDM, Pressure Systems Safety Regulations 2000 (PSSR), British Compressed Gas Association (BCGA) Codes of practice, Gas Safe, WRAS. 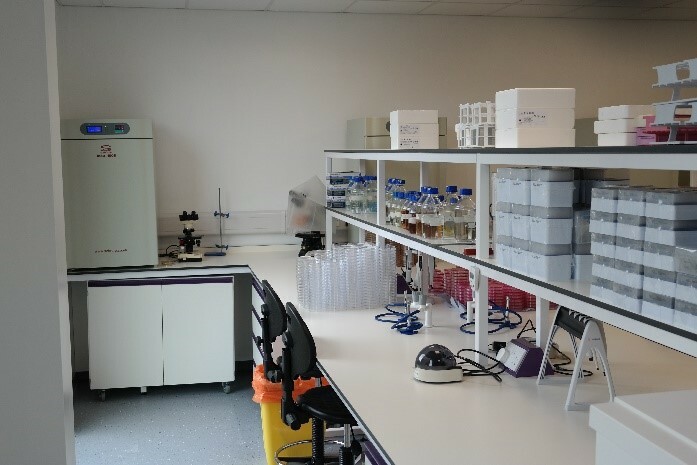 Completed on time and within budget, the Perfectus Biomed new laboratory adheres to all required standards and regulations. The infrastructure for growth is also in place in advance allowing Perfectus Biomed the opportunity add to the design as and when required. Higgins continues to support Perfectus Boimed with maintenance and annual servicing of the specialist gas system. About Perfectus Biomed: Perfectus Biomed is a leading UKAS accredited Contract Research Organisation (CRO). 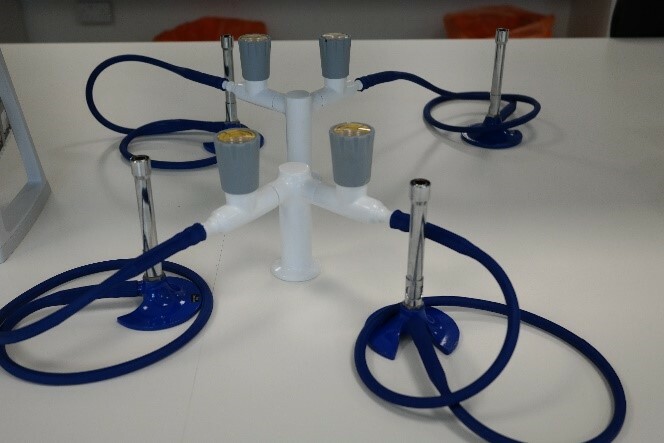 They provide both standard and customised microbiology with extensive experience in developing ‘fit for purpose’ experiments that mimic ‘real-life’ scenarios. 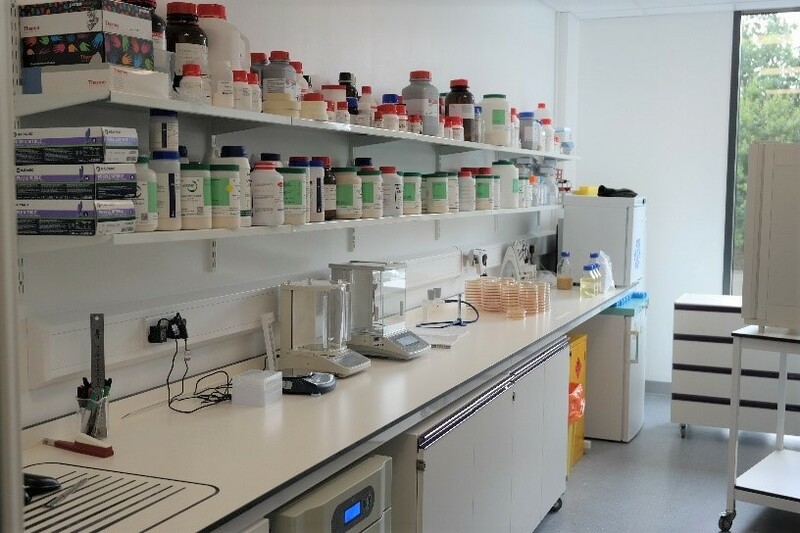 Their scientists specialise in antimicrobial, biofilm, viral, fungal and cellular research and support a variety of sectors including; wound care, medical device, dental, household care, cosmetics and water treatment. Empty laboratory, before the move in. Large windows in all working spaces provide a scenic view to the outside from within the environmentally controlled Category 2 laboratory. 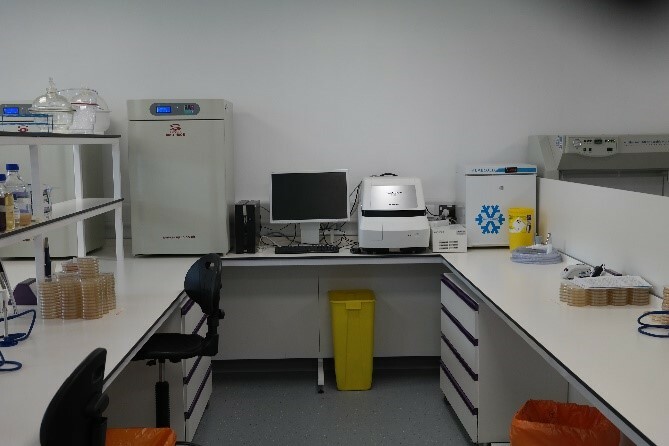 Plenty of useable work space and suitable space for equipment such as the confocal microscope. 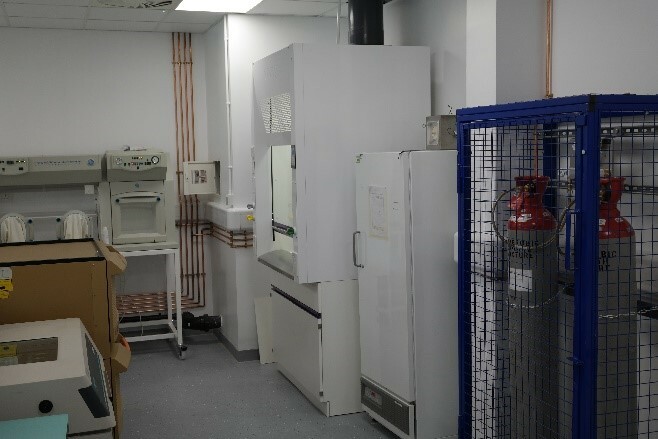 Large equipment area featuring built in fume cupboard, anaerobic cabinet, shaking incubators. Fume cupboard and caged gasses.